As Newark began to expand as a commercial center, additional housing was needed for moderate- and middle-income tenants. Since individual houses were not always the answer, the apartment house—as in the case of most major American cities—was the solution to providing decent housing for the armies of workers employed by the city's insurance companies and banking houses. One answer was the low-rise apartment house, which began appearing in the five decades following the 1920s. Slowly two-, three- and four-story apartment houses began to replace some of the High Street mansions between Court Street and Clinton Avenue. They also began creeping up along Roseville Avenue between Orange Street and Park Avenue and along the upper reaches of Mt. Prospect Avenue, from Second Avenue north to Elwood. Because of this new need for housing, large numbers of people eventually called the low-rise apartment home. High Street's Albright Mansion and Mt. Prospect's Turnbull and Ballantine mansions gave way to efficient two- and three-room apartments for Newark's burgeoning clerical and middle-income workers. At 19 Lyons Avenue is an outstanding Art Deco-style apartment house renovated in 1987 by the Cali Associates of Cranford for $7.8 million. It is a six-story condominium structure. When it reopened 10 years ago, units sold for $85,000 to $95,000. One of the largest of the new garden complexes was Forest Hill Terrace, built and owned by Harry and Sydney Waxman. Its 12 buildings, built adjoining Branch Brook Park, appear to be in a park setting opposite the county tennis courts and one of the loveliest cherry blossom displays in the country. Forest Hill Terrace was designed by Erwin Gerber, a local architect, with an FHA loan of $3.7 million, to house 480 families. By 1951 the first 150 apartments had been rented. The provision of comfortable middle-class housing was Gerber's goal. An average three-room apartment was key to meeting the needs of moderate-income residents in terms of size and style. Newark's Kresge Department Store, which decorated a model apartment, described it in the following way: ''The living room has been converted into a dual-purpose room furnished with a Simmons hide-a-bed, flanked by a chair and end tables in mahogany and an oval Duncan Phyfe glass-topped table, and on the other side of the room, a gold damask camel back chair and a dark green club chair. Along the wall opposite the windows is a flip-top console table and two side chairs. A mahogany Drexel group furnished the bedroom. The bedspread and drape are a combination of plain and floral chintz, and the rug is of white cotton shag.' By 1950 the land that once was occupied by the old Heller Estate became home to 500 families in an attractive suburban surrounding. About the same time as Forest Hill Terrace was being developed on Branch Brook Park, Arlington Arms was being built for 87 families at 417-427 Mt. Prospect Ave. The $800,000 development spread from Mt. Prospect Avenue east to Woodside Avenue. The complex was designed by Erwin Gerber for David Little and Murray Garfield, and was three stories high on Mt. Prospect and five stories on Woodside. A public stairway ran along the building's northern side. Arlington Arms consisted of 269 apartments. An opening ceremony, a buffet luncheon catered by Rod's Caterers, attracted members of the Essex Building Trades along with City Finance Director Meyer Ellenstein. About the same time, Cromwell Terrace (known today as the Parkwood Place Apartments) came into existence. Harry N. Wolfinger and Harold and Raymond Kramer built the set of seven five-story apartment buildings on the old Ballantine Estate, behind the Clark Mansion (now the North Ward Center). They bought the site of the old Ballantine Estate for approximately $3 million. Spread around a park-like setting that covers four and a half acres, the apartments housed 263 families. As in the case of other buildings along this side of the street, there are wonderful views of Newark and winding paths pass through lawns and gardens that provide a higher quality of life. Rentals at the time of the apartments opening ranged from $66 to $110 monthly. Playgrounds were available. Fire-proof sprinklers were found throughout the structure, and outdoor as well as indoor parking was available for tenants and visitors. In 1964 High Park Gardens in the Central Ward emerged as an owner-occupant complex, benefiting from a loan of $7 million. One of the few existing housing cooperatives in New Jersey, according to newspaper accounts, its Colonial-style buildings are bounded by Montgomery, Somerset, and Quitman streets on a 610,000-square site. The co-op concept of residential apartment ownership was a rarity at the time. The units were built by Jack Parker Associates, starting with the first section in 1964. The complex owes its existence to the National Housing Act of 1950. Occupants of High Park Gardens differ from other apartment dwellers they own the units and are stockholders in the nonprofit High Park Gardens Urban Renewal Cooperative. Amity Village, which occupied a block between 18th and 19th avenues and 19th and 20th streets, began as an experiment in July 1968. It consisted of three-family houses renovated by the Tri-City Citizens Economics Union Inc., a nonprofit group formed to improve conditions for underprivileged families in the Newark-Paterson-Jersey City metropolitan area. According to its officials, the function of Amity Village was 'to make the housing aesthetically pleasing as well as optionally utilitarian.' In addition to providing good housing, Amity's purpose was to expand the quality of living facilities, to increase the experience of black professionals and craftsmen in construction, to provide apprenticeship opportunities in the construction trade, and to get involved in the white business community. The immediate result was to provide 29 homes the residents would own rather than rent. Plans included involving community members in the decoration of individual buildings. Original funding came from community sources. A $1.2 million mortgage was granted by the New Jersey Housing and Finance Agency. What was termed a bold new venture in housing gradually dissipated into disrepair and abandonment. The second half of the 20th century was marked by the construction of many high-rise apartment buildings, particularly in the 1960s, even later. While most of these buildings went up in Forest Hill along Mt. Prospect Avenue, and in Weequahic along the Elizabeth Avenue Corridor, others reached the far flung outskirts of Vailsburg and the southern reaches of Branch Brook Park. Other went up on Broad Street. 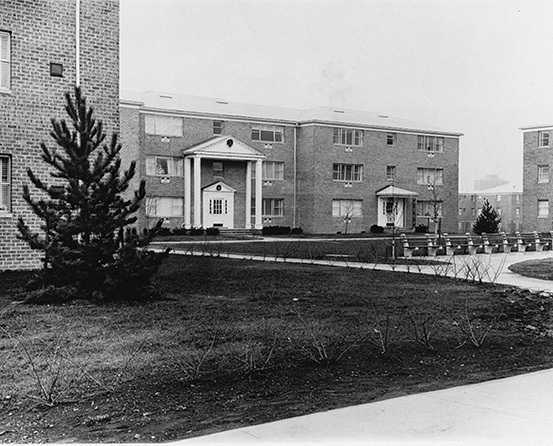 In 1952, the largest private apartment complex in New Jersey—one of the largest in the United States—was completed at Ivy Hill at the western end of Vailsburg in the West Ward. Here 2,100 apartments were built to house 8,000 to 9,000 tenants. Each of five huge buildings is 14 stories. Like the downtown Colonnade Park, the Ivy Hill towers form a city within a city. The Colonnade Park came into existence largely through the efforts of Herbert S. Greenwald and Samuel Katzin, who collaborated with world-famous architect Ludwig Mies van der Rohe. The steel-and-glass towers became a symbol of a New Newark Movement, which spurred an era of downtown revitalization. The tragic air plane crash and death of developer Greenwald did not put an end to the enterprise. Bernard Weissbourd continued the development. In 1960, the first of the three new Colonnade towers opened bearing similarity to developments in Detroit. By 1960 two buildings at 351 and 381 Broad Street were finished. By 1961 the Clifton Avenue structure was added, becoming the largest single apartment building ever constructed in New Jersey. The seemingly all-glass curtain wall construction of anodized aluminum and glass housed more than 560 apartments with floor-to-ceiling windows and a promenade deck 30 feet wide. The building itself was 446 feet long, 213 feet tall. The two two-story high lobbies of the Clifton Avenue building each had banks of three elevators. Amenities also included a series of basement shops, a laundry and direct New York City bus service. The Mt. Prospect Tower Apartments at 380 Mt. Prospect Ave. is a 15-story, white brick apartment built in 1961—the first of several new luxury high-rise buildings to appear along the avenue. Its lobby looks out on a manicured front lawn and hedges, and its nine bay front is set at a broken angle to the street. Many of the apartments have balconies facing the avenue. Key figures of the boom were Frank and Norman Seidenwurm of Country Estates Construction, along with officials of the Taylor International Corp. They also were responsible for the high-rises at 515 and 555 Mt. Prospect. 402 is a 15-story red brick building with corner balconies and a maroon awning and sign announcing its name to passersby. The high-rises apartment buildings at 515 and 555 Mt. Prospect Ave. are now called Towers II and I. Each is 16 stories. 555 was designed at an angle to the street. Built of light pink brick, its awning and signs are blue; 515 is red brick. Its awnings and sign are green. In 1968, Zion Tower in the Weequahic section, a 29-story 265-unit apartment at 515 Elizabeth Ave., opened as part of a proposed $150 million redevelopment program in the Weequahic Park area. At a cost of $5.5 million, it was financed through the New Jersey Housing Finance Agency. Zion was the third high-rise apartment of a vast construction project that included Weequahic Park Plaza at 555 Elizabeth Ave. and 455 Elizabeth Ave., which opened first. Zion Tower was built by Arthur Padula and designed by Romolo Bottelli. Designed of brick and glass and raised over a four-story concrete base, it had space for 135 cars. Ground-breaking occurred December 2, 1968 with Mayor Hugh Addonizio, Padula, Rabbi Oscar Kline and 259 families from Congregation B'nai Zion taking part. At the south end of town the 21-story $3 million Weequahic Park Tower at Elizabeth and Meeker avenues was completed in 1961. Taking part in its dedication were Mayor Leo Carlin, Newark FHA director Peter Longarzo and Arthur Padula, the builder. Weequahic Park Towers was designed by Romolo Bottelli Jr. According to the builder's description, it was 'sheathed in porcelain enamel on steel panels and continuous glass providing maximum light.' One of Newark's first fully air-conditioned apartment buildings, it was completely fireproof and contained a garage for 70 cars. The tower is approached by a wide circular drive and includes a recessed and marquee entrance of terrazzo, marble and glass. Hill Manor Apartments on Martin Luther King Boulevard is a 21-story 420-unit apartment building that gradually fell into disrepair and is slated for demolition by the end of this year. Several years ago two women died who could not be reached by emergency workers when a fire caused elevators not to operate. Today, Hill Manor is a boarded-up eyesore on Martin Luther King Jr. Boulevard overlooking downtown Newark and the city's Central Ward. St. James Towers was constructed in the early '70s as a 200-unit building at Washington and West Kinney streets. Tenants are required to make a down payment on their units in addition to regular monthly rentals. The building is associated with St. James AME Church, one of Newark's oldest congregations. A nonprofit agency operates the 20-story tower. A $6.5 million loan from the New Jersey Housing Finance Agency resulted in a 48-year mortgage. The builder was the Parker-Washington Construction Co. of Newark. Eugene A. De Martin of Lyndhurst was the architect. There are one, two and three bedroom apartments. Down payments range from $500-$800. When the building opened, monthly rents ranged from $160-$235. A co-op concept, involving risks and responsibilities as well as rights and privileges, is in force at St. James Towers. As part of the rental agreement, damage to an apartment is deducted from the renter's deposit.